Klaus Spies was born in Saarlouis, Germany. He traveled extensively through South America and Mexico where he first learned the art of goldsmithing. He pursued his craft in Berlin, Germany through the 80s under various goldsmiths and designers and in a collaborative jewelry studio in Kreuzberg. Klaus moved from Berlin to Chicago, IL in 1999 where he started Spies Design. 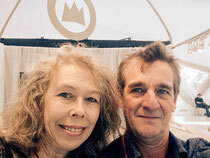 Since then, Klaus has been exhibiting in numerous art fairs and galleries throughout the country. In 2008 he moved to Asheville in the mountains of western North Carolina where he now has a studio and showroom in the city's lively downtown.